LONDON - A Canadian who became a pioneering giant in British television was honored this week in a special documentary that suggested he may have had "a greater influence on the development of TV than anyone else." 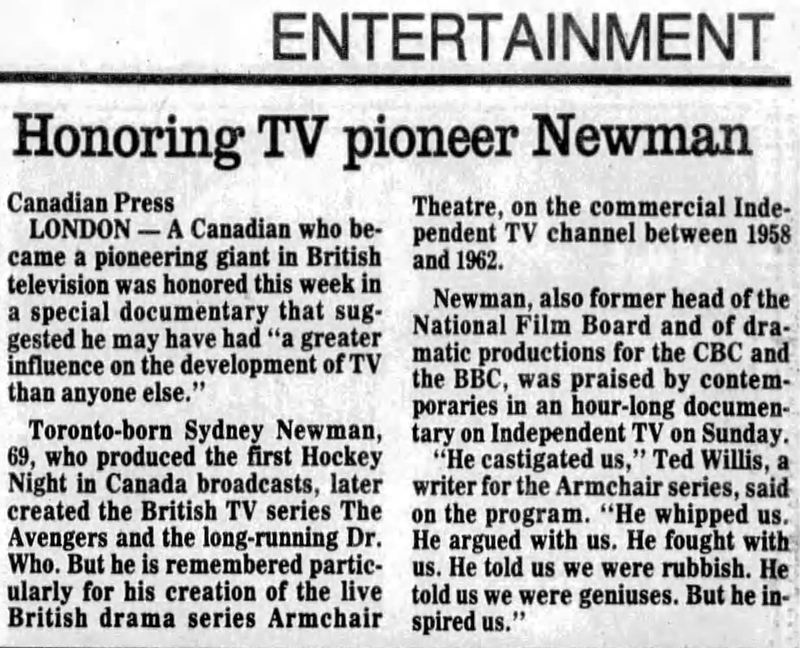 Toronto-born Sydney Newman, 69, who produced the first Hockey Night in Canada broadcasts, later created the British TV series The Avengers and the long-running Dr. Who. But he is remembered particularly for his creation of the live British drama series Armchair Theatre, on the commercial Independent TV channel between 1958 and 1962. Newman, also former head of the National Film Board and of dramatic productions for the CBC and the BBC, was praised by contemporaries in an hour-long documentary on Independent TV on Sunday. "He castigated us," Ted Willis, a writer for the Armchair series, said on the program. "He whipped us. He argued with us. He fought with us. He told us we were rubbish. He told us we were geniuses. But he inspired us." APA 6th ed. : (1987-02-11). Honoring TV pioneer Newman. The Vancouver Sun p. F8. MLA 7th ed. : "Honoring TV pioneer Newman." The Vancouver Sun [add city] 1987-02-11, F8. Print. Turabian: "Honoring TV pioneer Newman." The Vancouver Sun, 1987-02-11, section, F8 edition. This page was last modified on 19 February 2019, at 00:25.